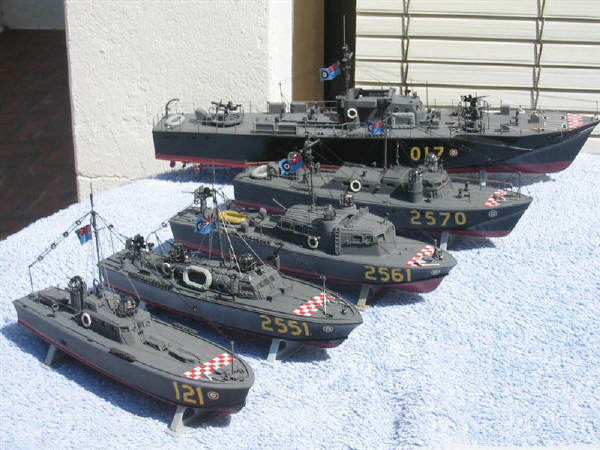 Here are the Coastal Forces and RAF craft which have been built by me as requested. The boats were built for my father's collection, he is now 81 and has owned very many of the actual boats over the years. They are mostly on the Real Thing. He currently has Gibel-Tarik ex RN 72ft HDML 1301,Fervent ex RN 63ft MA/SB 32 and Flywood ex RAF 68ft RTTL 2753. 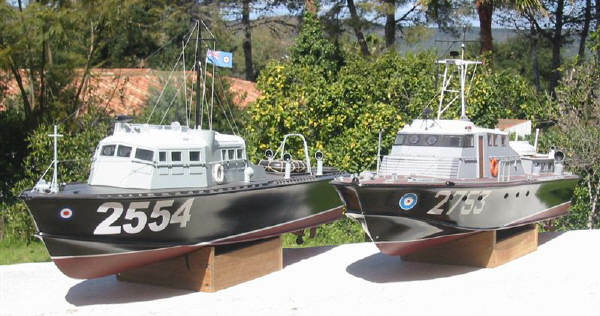 1/72nd E-Boats are the kits available from Airfix and Revell, unmodified. 1/72nd LRRC and 4 HSLs are a mix of an Airfix kit(63ft Whaleback HSL 2551),conversions from this kit,i.e.using modified hulls and the fittings and armaments(64ft 100 Class HSL 121,68ft Hants and Dorset HSL 2561) and scratch-builds(73ft Vosper HSL 2570 from plasticard and 115ft Fairmile D LRRC 017 from 1mm formica). 1/72nd RN Craft again a mix of kits (Matchbox Flower Class Corvette K142 which was someone else's unfinished project, Airfix 4-tube 73ft Vosper MTB 385),conversions(Vosper 2-tube 70ft MTB 78 from same kit,63ft MA/SB 32 from Airfix Whaleback) and a scratch-build (Fairmile D MTB 795) using some Airfix fitting and armaments. 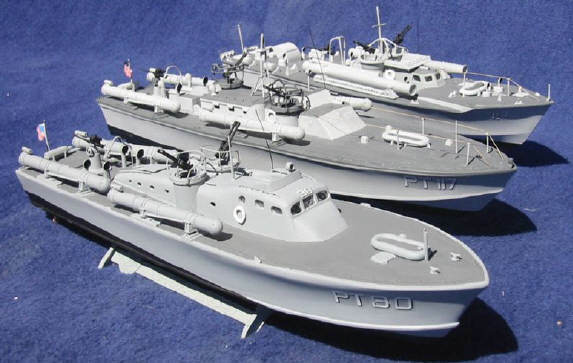 1/72nd US PT Boats are the Revell kits "British"(lend-lease)70ft MTB and Elco 80ft PT 117 ,and a much modified Elco kit representing the 77ft Elco PT 30 with Scott-Paine's unique hull design. 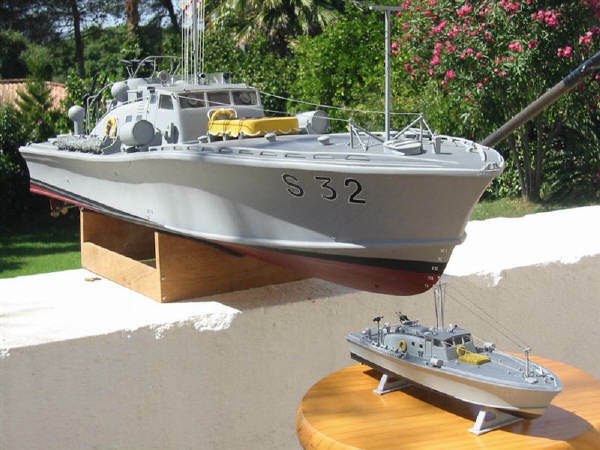 1/16th BPC 63ft MA/SB 32 is a display model scratch-built using pine planking for hull and deck, ply deckhouse and homemade fittings and guns (and is pictured with the 1/72nd version just for fun). 1/16th BPC MTB 494 is also a display model scratch-built from GRP(I used the MA/SB as a plug for a mould which I then modified to the 71.5ft design) and ply deck and bridge with home made fittings and armaments. 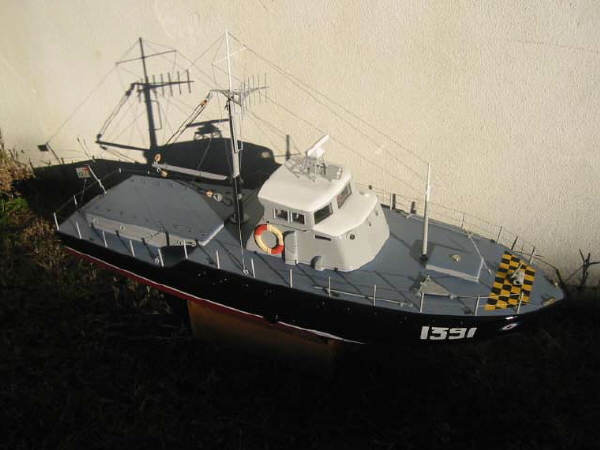 1/20th semi-scale 63ft RAF GSP 1391 is my old Aerokits Sea Commander much altered to look something like the real thing,still powered by the same ancient diesel & with 2-ch radio. 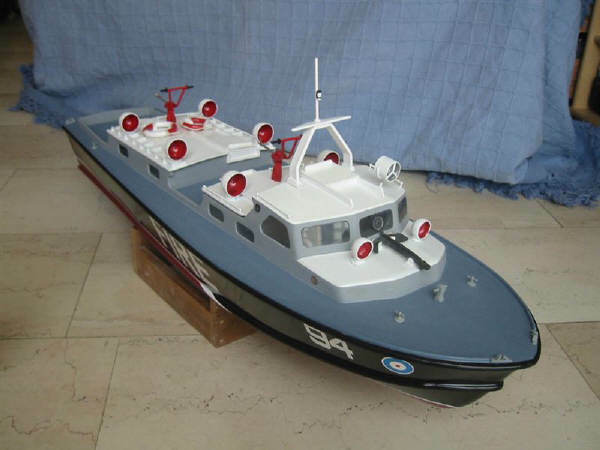 1/20th Vosper Crash-Tender is the Aerokits model, powered by an Enya and with 2-ch radio. 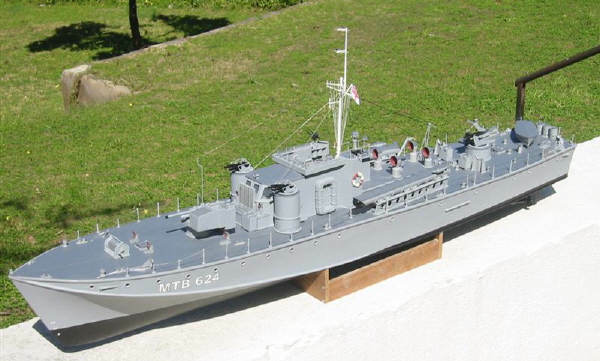 1/24th RTTLs; the 2554 BPC Hants and Dorset is a scratch-build using the ply from an old Crash Tender hull re-cut to John Pritchard plans and given curvature to the topsides and under the chines, with ply deck and Formica deckhouse. Fittings from scratch except cowl vent tops and searchlight. Powered by a cute little Enya 09 and with 2-ch radio. 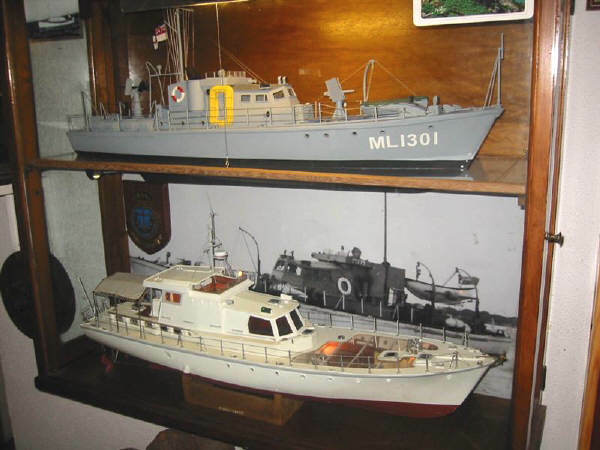 The 2753 Vosper is a display model from Formica hull and deck-house with ply deck and a mix of scratch-built and bought fittings, the brass tripod mast having been bought by my big brother in the 60s.She has a detailed and illuminated engine room and deckhouse interior. 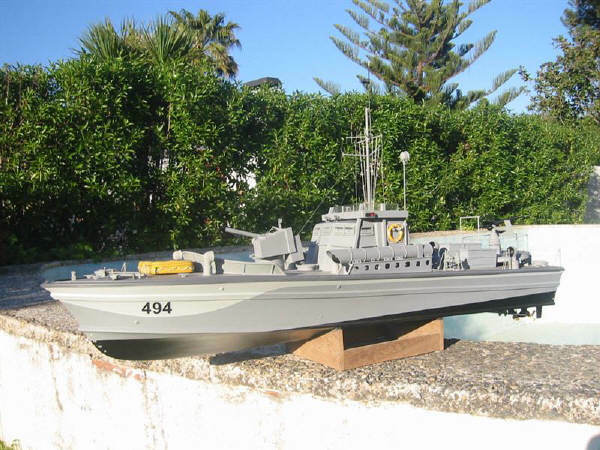 1/24th Fairmile D MTB 624 is a modified (to remove moulded-in torpedo scallops) GRP hull bought 2nd-hand with twin electric motors and 2-ch radio. The deck is ply and superstructure is Plasticard over a ply stiffener. Fittings and armaments are a mix of bought and homemade stuff. 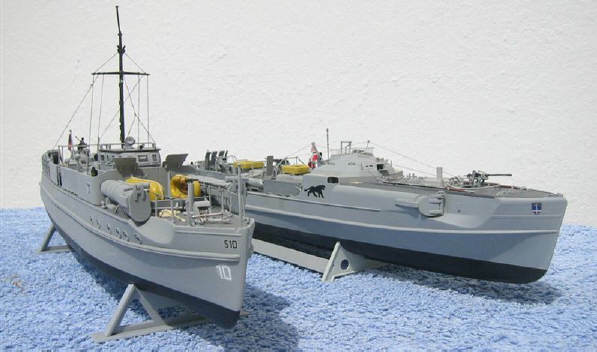 1/24th Fairmile B RML 550 has a scratch-built hull using epoxied double diagonal veneer strips over ply frames and ply deck and superstructure. Twin electric and 2-ch radio. Fittings are mostly bought. 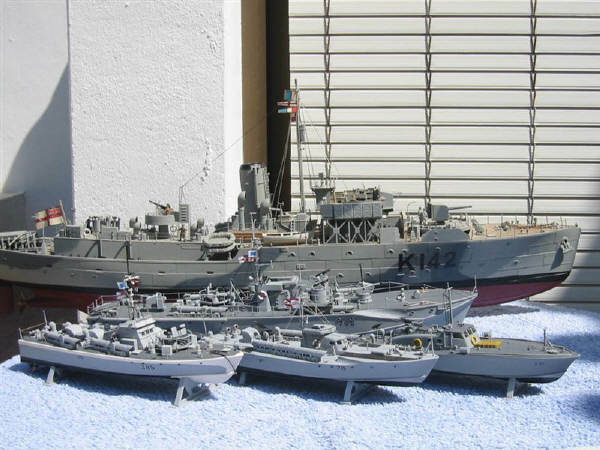 1/24th HDML 1301 then and now models;" then" is a vac-formed hull, ply deck & superstructure and mostly purchased fittings and armaments." Now" use same hull, but is fitted out using only home-made items and the interiors are fully detailed and illuminated with perspex panels let into the decks for viewing. Twin electric and 2-ch radio. I hope the above will be of some use and that the photos are OK, keep up the excellent work with your wonderful site.